Day: Saturday, September 12, 2015 NOTE: this event has already happened, find current-year events on the events page. We had 40 vehicles. The most abundant vehicle was the Leaf. Quickest Tesla Model S.
Other notables New Flyer Xcelsior electric bus, UMSAE electric race car, 1954 Austin Somerset Chevy S10 pickup and UMSAE electric race car. It was a beautiful sunny day, 27C. We were part of ManyFest which had 35,000 people. Roughly 1/3 walked through our area. We had many people stop by while we were setting up. There were lots still asking questions during tear down. People were shocked to learn that we can drive a whole year and create less pollution than a litre of gas (yes, one). And that we drive a year on $100 of electricity. Also, that these vehicles work fine in -30C Manitoba winter. Rob Altemeyer, MLA for Wolseley, attended. This year MEVAfest has moved downtown to the Legislature Building. Members and owners will provide information about EVs, cars, trucks, SUVs, motorcycles, scooters, bicycles, boats and airplanes. We believe that all vehicles should be electric. There are currently 6 attendees registered. 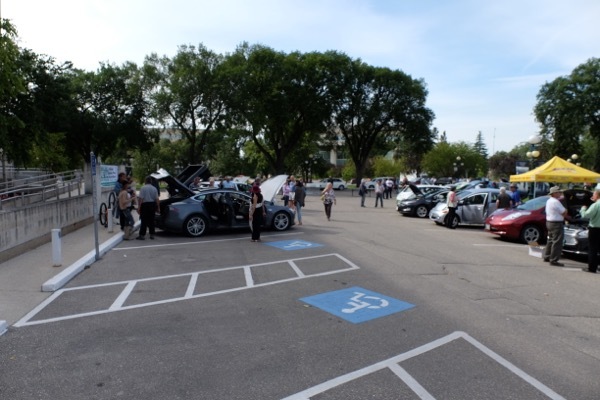 Registered attendees report 64,515 electric miles driven.